In Future Trends – Robots Need Humans we look at the growth of industrial robots that need our help, removing echo, visions of the world in 2050, Bitcoin adoption in Japan, and cheap short-haul electric flights. The popular narrative about robots is that they are stealing human workers′ jobs. A new paper published by the National Bureau of Economic Research broadly supports this belief, estimating that each additional robot in the American economy reduces employment by 5.6 workers. However, the relationship between automation and employment is not always straightforward. One big trend is the growth of “collaborative robots”, smaller and more adaptable machines designed to work alongside humans. Barclays, a bank, thinks that between 2016 and 2020 sales of these machines will increase more than tenfold. Moreover, by improving productivity, automation can sometimes create new jobs for humans, or at least relocate them. 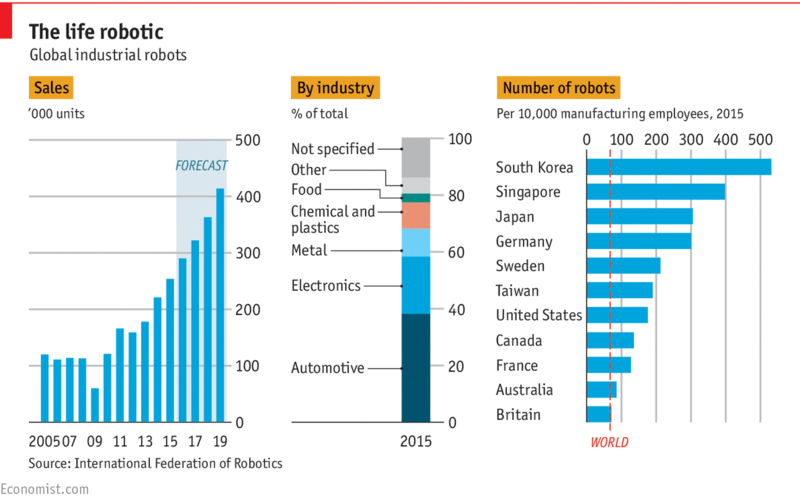 Adopting robots has made it economical for some manufacturers in high-wage countries to “re-shore” production from poorer countries. This year Adidas, a sportswear firm, will begin producing running shoes in a German factory staffed by robots and 160 new workers. The internet, despite promising to broaden our horizons, can serve to narrow them. In the wake of Brexit and the US elections, we have seen several innovations designed to encourage internet users to engage and debate with those outside of their tribe. One such innovation is a video platform which emboldens users to participate in live video debates with those outside their networks, and now The Perspective is a current affairs website encouraging readers to engage with opinions opposite to their own. 2050 is only about 30 years from now, which means it’s close enough that we can imagine it happening, but far enough away that we can’t confidently say what it will look like. Maybe that’s why 2050 is the year Kaspersky Lab chose to envision for its new futuristic, interactive map. The map, called Earth 2050, imagines our world three decades from now, Wiredreports. The project allows users to explore how different cities around the world might look in 2050, 2040, and 2030. It’s like Google Street View, except the streets are all a little shiner looking. Each city and experience is equipped with predictions from experts at Kaspersky, futurologists, and random site visitors. Predictions range from the believable (humans will live in buildings stocked with amenities so they’ll never need to leave their homes) to the strange (toilets will analyze our poop) to the ambitious (students will be able to choose what time they go to school, thanks to pop-up hologram teachers). accept bitcoin as payments, in an interview with Bitcoin.com in January, Coincheck revealed that more than 5,000 merchants and websites accept bitcoin through the company’s system. Electronic money is popular in Japan. In addition to cash payments, some of the most popular electronic payment methods are Suica and Rakuten’s Edy, which are rechargeable contactless smart cards. While Suica is accepted at about 380,000 outlets and used as a fare card on train lines in Japan, Edy can be used at 470,000 locations nationwide. Bitcoin will be accepted at 260,000 shops by this summer. Zunum Aero, a company backed by funding from Boeing HorizonX and JetBlue’s tech venture arm, has revealed its plans to create a hybrid electric aircraft designed for regional flights with plans to fly by 2020. The aircraft would have a range of around 700 miles at launch, and the plan is to get that up to over 1,000 miles by 2030, which means it could service many popular commuter routes in the U.S., potentially. The Zunum Aero plane is designed around the idea that by routing more traffic to regional hub airports, and providing much lower operating costs for smaller craft with between 10 and 50 seats that do short-haul trips, between locations like L.A. and Silicon Valley, air travel can become much more efficient and convenient for commuters. Zunum says that air travel between hubs as an alternative to slower options like overland rail and highways hasn’t really gotten any better in the last 50 years, but it hopes to change the economics with its electric drive technology.